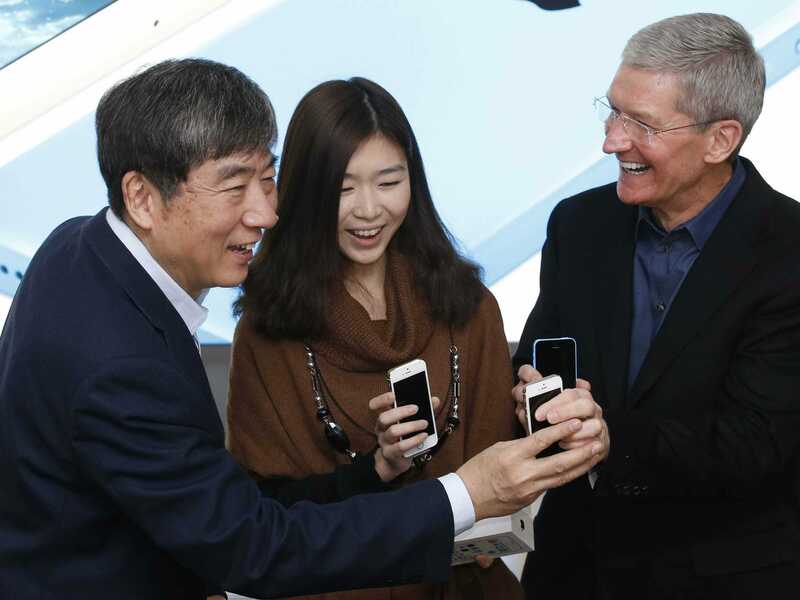 Kim Kyung Hoon/ReutersApple Inc. CEO Tim Cook, right, and China Mobile’s Chairman Xi Guohua, left, with a customer at an event celebrating the launch of Apple’s iPhone on China Mobile’s network at a China Mobile shop in Beijing on Jan. 17. In the middle of the night, Apple announced a deal that should make it a much stronger company in China. Apple added China UnionPay as a payment option for the App Store in China. UnionPay has “a virtual monopoly on processing payments between merchants, banks, and credit card companies,” according to Quartz. Previously, Chinese consumers interested in buying things through the App Store had to go through a complicated process setting up a prepaid account. According to The New York Times, that meant selecting a bank, then providing an online banking password, then depositing at least $US8. With UnionPay linked to iTunes accounts, consumers will be able to quickly and easily make purchases. There’s no word from Apple on linking UnionPay with Apple’s mobile phone payment system Apple Pay, but this would be a good sign for that happening in the future. China is Apple’s second-biggest market for App Store sales despite the complicated process needed to buy apps. Now that it’s even easier, it’s like putting the App Store on steroids. It should lead to a nice boost in sales. BEIJING — November 17, 2014 — Apple® today announced that the App Store℠ has added UnionPay as a payment option for customers in China. China UnionPay is the most popular payment card in China and will provide App Store customers with a simple and more convenient way to purchase their favourite apps. Customers can easily link their Apple ID with a UnionPay debit or credit card for one-tap purchases.